Two years ago, Spirited Away won an Academy Award for Best Animated Picture. For many Americans, it was their first taste of the fantastic world of Hayao Miyazaki (and if you haven’t seen his other films, get thee to the Video Station). Miyazaki follows it up with another magical movie with a strong young heroine named Sophie (voiced by both Emily Mortimer and Jean Simmons in the dubbed American release). She makes hats in a nameless, quaint, post-Victorian village. She encounters a hunk of a young man in an alley who is trying to escape from some oil-blob baddies who materialize out of the walls. Sophie seems as surprised by their appearance as we are, although that’s not half as surprising as when the boy flies her home to her balcony. Soon thereafter, an enormous witch with six or seven chins visits Sophie and casts a spell on her, turning her into an old woman and forbidding her to speak of the spell. Who are these people? Why are they picking on a poor hatmaker? And who is this Howl person that the witch mentioned? We’d like to know, too. A turnip-headed scarecrow helps her find the way to a gigantic walking castle. Inside, she befriends a fire demon named Calcifer (Billy Crystal, who is grating until you acclimate to his voice), a boy apprentice named Markl (Josh Hutcherson), and a familiar-looking wizard named Howl (Christian Bale). At two hours long, the movie covers a lot of ground, but the plot boils down to this: many different people need to undo curses and spells that keep them from being their true selves. 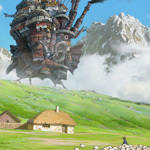 Visually, Howl’s Moving Castle is as good as any other Miyazaki movie. The world looks like Alaska in summertime. There are green grassy wetlands sprinkled liberally with small wildflowers and clear, cool daylight. The characters, too, are animated with all the love and attention needed to bring them to life. The plot, however, doesn’t seem as compelling as Sen’s rescue of her parents in Spirited Away or of the restoration of the forest in Princess Mononoke. Lifting spells and breaking curses seems pretty abstract, and feels more like a contrivance than some of Miyazaki’s other movie’s plots. It also lends itself to some anti-climactic climaxes. The DVD comes with the usual batch of extras that Disney has put on its other Miyazaki releases. It has Behind the Microphone, with interviews of the English-dub cast and crew. It has some featurettes about the movie made for Japanese TV. And disc two is reserved for a storyboards-only version of the movie. The Japanese TV segments, called Interview with Pete Docter and Hello Mr. Lasseter, are definitely worth a look. They can be a bit confusing because the questions are asked in Japanese (with no translation) and the answers are presented in English. But both Docter and Lasseter have the usual upbeat stories to tell about the production and the redub of the movie for American audiences. The first part of Hello Mr. Lasseter features video footage of Miyazaki’s surprise visit to Pixar HQ and John Lasseter’s excited, surprised welcome. Miyazaki had brought a giant stuffed cat bus (from My Neighbor Totoro), which he presented to Lasseter. The DVD also a section of TV spots and trailers from Japan that didn’t do much for me. In my theatrical review I said that no home video version could do justice to the detail packed into the screen at theaters. And although I have a pretty big screen at home, I have to say that I was less taken by the detail on DVD than I was in the theater. That said, the DVD looks as good as can be expected. The colors are rich and striking, and the print is pristine. The audio is recorded in Dolby Digital 5.1 in English, Japanese, and French tracks.